Family, that slippery word, a star to every wandering bark, and everyone sailing under a different sky. After his mother's death, Richard, a newly remarried hospital consultant, decides to build bridges with his estranged sister, inviting Angela and her family for a week in a rented house on the Welsh border. Four adults and four children, a single family and all of them strangers. Seven days of shared meals, log fires, card games and wet walks. But in the quiet and stillness of the valley, ghosts begin to rise up. The parents Richard thought he had. The parents Angela thought she had. Past and present lovers. Friends, enemies, victims, saviours. And watching over all of them from high on the dark hill, Karen, Angela's stillborn daughter. 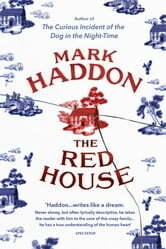 The Red House is about the extraordinariness of the ordinary, weaving the words and thoughts of the eight characters together with those fainter, stranger voices - of books and letters and music, of the dead who once inhabited these rooms, of the ageing house itself and the landscape in which it sits. Once again Mark Haddon, bestselling author of The Curious Incident of the Dog in the Night-time and A Spot of Bother, has written a novel that is funny, poignant and deeply insightful about human lives. I thought The Red House by Mark Haddon was a wonderful read, at the begining I thought I would honestly find this book boring, but the more it went on I started to really enjoy it. I would really recomend this book to read. I guess the moral of the story is not to judge a book my its cover. For discussion at next book group. Think will be an interesting chat and there will be diverse views on it.